Welcome to my 2014 Disney Fantasy Western Caribbean Cruise Review!!! I’m Victoria, a new alumni of the Clemson University School of Architecture!!! In addition to architecture, I enjoy photography, traveling, and sharing my experience with others. This review will be told in a journalistic style with lots of photos. With the exception of this first post, I don't expect there to be too many posts with only paragraphs and paragraphs of text – I rely greatly on photos to tell the story. I also don’t take myself too seriously, and you shouldn't either. There will be a lot of fun-poking and maybe a little sarcasm, and you’re all invited to join in on the fun! I encourage you to post comments to share your thoughts and experiences, or just tell me who you are! I don't normally start my cruise reviews with a history of my past cruises, but with this cruise being such a monumental one, I thought this would be fun. Feel free to skip this section if you aren't interested - you don't have to tell me! 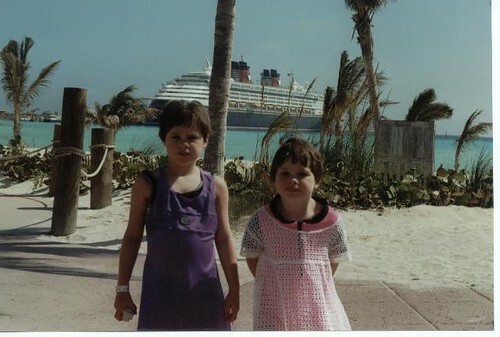 My first cruise ever was actually a Disney Cruise. It was a 4-night Bahamian cruise on the Disney Magic on April 10, 2000. I know this because after booking the Disney Fantasy, I looked up my Castaway Club membership, the exact date of our cruise (and the cabin number - 6120!) appeared in my "Past Cruises" record. I need to ask my parents why they decided to take a Disney Cruise. It might be because my parents have always enjoyed Walt Disney World and thought that if Disney did cruises, they might as well give it a go... maybe they were interested in cruising but never thought to try it until Disney Cruise Line... or maybe someone my dad worked with suggested it to him. I really don't know. So why switch cruise lines? Well, I don't think that my parents were necessarily looking to cruise again, except my mother's parents wanted to go to Alaska. They were going to drive their camper to Alaska, but none of their children thought that was safe, so it was suggested that they cruise instead. I believe it was my dad and my uncle who researched Alaskan cruises, and my family accompanied my grandparents on Royal Caribbean's Radiance of the Seas. It was a cruise without many children, so we got a lot of personalized attention in the kids' club which was much more enjoyable for shy children like my sister and myself. I think my parents were also pleased because Royal Caribbean cruises are a bit more affordable than Disney Cruises. After that cruise, Royal Caribbean became go-to cruise line. We tried Carnival a few times, but stayed relatively 'Loyal Royals'.... until we had just too much. The itineraries became been there/done that, as did the ships. It was time for a change, and I became enticed by Princess Cruises' 10 and 11-day Panama Canal Partial Transit itineraries. For our 2012 Christmas Cruise, I convinced my family to sail the Island Princess Panama Canal. Then it was the Norwegian Epic in the Mediterranean and Royal Princess in the Caribbean. I really love Disney. It just makes me incredibly happy. I have a great appreciation for "The Man Behind the Mouse" and particularly enjoy Walt Disney's history in his company, as well as his personal life. I love Disney Parks and the attention to detail and creation of environment. The high-quality design throughout the parks, merchandise, and movies makes me happy. I regained an interest in Disney Cruise Line with the introduction of the Disney Dream in 2011. I started researching Disney Cruises, but I found that they are actually significantly more expensive than our typical cruises - in some cases over double the fare in stateroom cost. The expensive cruise fare was no aid in convincing my Dad to return to Disney. 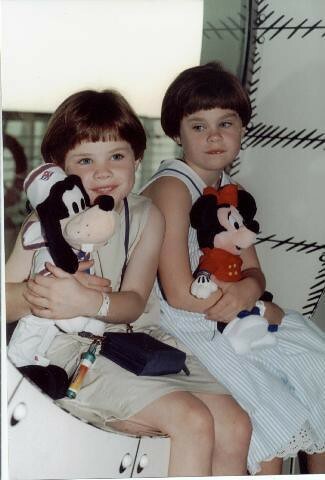 2) Disney Cruises are for children. / There will be too many children. 3) Disney isn't any better than our favorite cruise lines, and the extra cost won't be worth it to us. The only way to lock in a Disney Cruise..... was to declare it as my college graduation present! I wanted to sail on one of the new ships, and the longer the cruise, the better! So it was an easy selection of the Disney Fantasy Western Caribbean Cruise sailing May 10, 2014 - the day after my college graduation! Consisted of five adults, myself included. While everyone in the group would point at me as being the 'Disney Addict,' I feel like I must clarify that besides just myself, we aren't just average adults who may have had a fondness of Disney movies as children but otherwise don't care one way or the other. 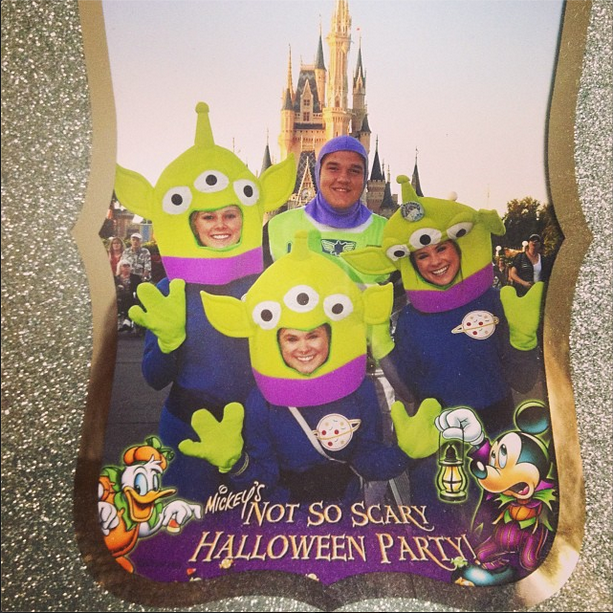 A friend once asked me if my entire family loved Disney, and I responded, "No, it's really just me." My roommate was quick to speak up, "They might not love Disney as much as Victoria, but they definitely like Disney more than normal people." I guess it's true. We visit Walt Disney World multiple times a year. My parents, sister, and I are current annual passholders at Walt Disney World. We visited Disney this past October and January.... and snuck in a quick day at Magic Kingdom after the cruise. My Dad and I have also had Disney Visas since 2012. And while my parents' entire house has Disney influences in artwork, there is an entire room themed Mickey Mouse. My dad, Boyd, visited Walt Disney World for the first time in 1971, the year that it opened. He must have liked it because in the late 80s, he and my mother bought a vacation home in Central Florida and bought annual passes to Walt Disney World. Not only is he a great father who supports my Disney love, but he's absolutely hilarious. If you aren't laughing at his jokes, you're laughing at how bad they are - either way, my dad might be the greatest contributor to my side-splitting laughter. My mom, Sharon, is an incredibly talented lady. She designed the Mickey Room and sewed these elaborate costumes. So of course I called upon her to make our beautiful Fish Extender. Like me, she has an eye for details and can pick out all of the little things that Disney does to tell the story. My sister, Rachel, might pretend every once in a while that she doesn't love Disney.... but don't believe her for a second because it's a lie. She loves Disney music and can sing along to every Disney song (her favorite is "Part of Your World" from The Little Mermaid). 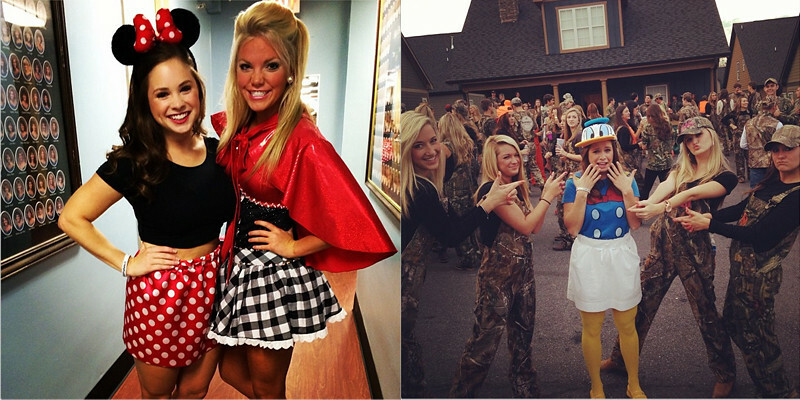 Rachel also enjoys dressing like Disney characters. She was Minnie Mouse for Halloween and Donald Duck for Mallard Ball (the theme is camouflage... she had a different approach). She was also the one who insisted that we go to Walt Disney World after the cruise. Like I said earlier, I wanted to sail on Disney Cruise Line to celebrate my graduation from Clemson University. I chose the Disney Fantasy because it sails 7-day itineraries (as opposed to the Disney Dream which sails 3 and 5-day itineraries). Date was more important to me than Eastern or Western, as I've sailed both routes before. May 10 was the date after graduation and allowed Max and Rachel to get back in time for their summer co-op/internships. Our cruise was the Western Caribbean Itinerary C which consisted of ports Cozumel, Mexico; Grand Cayman; Falmouth, Jamaica; and Castaway Cay. This was actually the first time that the Disney Fantasy sailed to Falmouth, Jamaica. We were told at embarkation that the Fantasy had been sailing to Costa Maya which past Disney Cruisers ranked 10th of ports of call, so they switched to Falmouth, Jamaica, which was ranked 3rd. I learned that this sailing was AllEars.Net's 15 Year Anniversary Cruise. I was really excited and looked into booking it... but unfortunately, booking through AllEars' travel agent was more expensive than our typical online booking site for the same category rooms. It was about a $200 per person difference, and while I would have paid that for myself, I didn't think it was worth it for everyone else in my family. Not to mention, this was a cruise to celebrate my graduation and spend time with family - not to spend time doing "Disney Nerd Things." I had a bit of difficulty choosing our category of stateroom. We booked two rooms - one for my parents and one for Rachel, Max, and myself. I wanted extra space so that it would be comfortable for three adults in one room, so I looked at family-size rooms. At first, I was set on booking a verandah stateroom, but after looking at room descriptions and deck plans, I realized that the family ocean view staterooms were in my preferred location (near the stairs), while the available family verandah staterooms were all mid-ship with long walks to the stairs. I decided to save the money (it was about $300 per person) and chose the family ocean view stateroom. My dad chose the magical porthole stateroom for himself and my mother. This is the most pre-cruise planning that I have done in a long time. I read the message boards for tips and "secrets" on Disney Cruises. I purchased PassPorter's guide to Disney Cruises which I read twice. And I read many trip reports and photo reviews. My Disney Cruise research led me to Fish Extenders, which are these (typically) fabric apparatuses with pockets that hang from the Fish (or Sea Horse) which is outside the stateroom for mail delivery. The idea is that these fabric pockets "extend" the fish. Disney people use these Fish Extenders for gift exchanges between passengers. People make or purchase gifts and pass them out to all of the staterooms in their exchange group. So I joined a Fish Extender (FE) Group for my cruise. I'm not exactly sure what I was thinking and realized how overwhelming the whole thing was a month before the cruise. My group had 23 cabins and over 59 people.... which meant at least 23 presents... which quickly became very expensive. I'm a recent college grad on a budget and kept a small budget of less than $60, which was doable thanks to the software and other resources which were available to me in the architecture school. I'll add more information about the Fish Extender gifts I made in the next post. As far as actual cruise preparation, I booked Palo, the adults-only restaurant for $25 per person. I chose Palo for dinner rather than the brunch because taking time out of the morning to eat a paid brunch didn't sound too enticing to me. Part of my reasoning for booking Palo was more for the no-kids venue, rather than the food. I'm not a foodie. My plan for the ports of call was to just go to the beach. We did end up booking a beach tour through the ship for Jamaica for $32 per person just because the last time we were in Jamaica (Ocho Rios), we were told not to take cabs anywhere, so we wanted the added safety of a cruise line-sponsored tour. I usually get several questions about cameras and gear, so below I've listed all of the gear in my camera bag for this cruise! What's in your camera bag? Comment below! Sail along with me on the Disney Fantasy! As am I! I just checked out your blog and am enjoying the beautiful photos and report of your Disney Magic sailing!